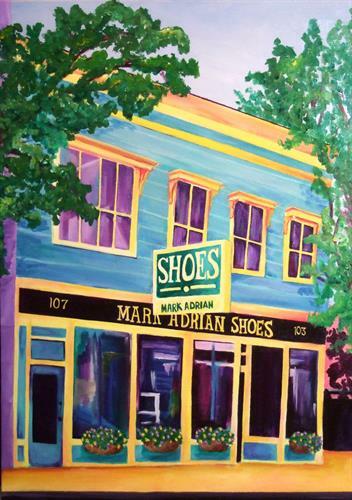 Since 1975, Mark Adrian Shoes has been a staple in downtown Gloucester. We have been helping locals and visitors alike with all of their footwear needs by always prioritizing comfort, value, and style. Many things have changed in the shoe business in the last 40+ years, but the biggest change for Mark Adrian Shoes happened January 2017. Founder Mark Adrian Farber, a 50-plus year veteran in the shoe business, has retired. His son, Adam Farber, has taken over and is leading the business forward. 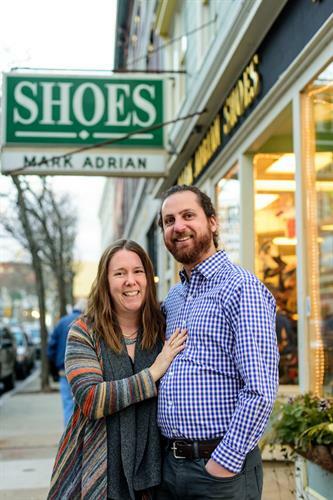 Adam is the fifth generation in the retail footwear industry and, together with his wife Sara, is proud to follow his family’s legacy. Adam is fully committed to the values inherent in the business his father built. In this age of impersonal online shopping, he and his staff are redoubling their efforts to help customers feel educated and confident in their many footwear choices. We are committed to fitting every foot with healthy stylish shoes, and to personalizing the shopping experience with the fashions to meet every taste. We also guarantee we will not be beat on price by any competitor online or in-store. In addition to our perennial favorite brands - Merrell, Keen, Teva, Naot, New Balance, Ugg, Dansko, Sperry, Birkenstock, among many others - Adam has added in some exciting new options. Blundstone, Olukai, and Rieker are among several new brands over the last few seasons, and our overwhelming success has demonstrated the eagerness of the consumer to embrace trendy comfort footwear. Sandals, Sneakers, Boots, Dress Shoes & More!